The Cesky Terrier's coat does not shed. That's the good bit! The downside is that it must therefore be groomed regularly or you will soon have a scruffy-looking pooch who is very matted and rather smelly. 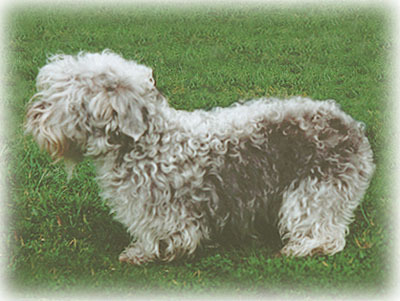 A Cesky Terrier that has not been trimmed for several weeks looks like this. To achieve the glamorous look of a Cesky Terrier in show condition takes time and effort, but it isn't difficult to do, and many owners get great satisfaction from learning how to clip their own dogs. Whether you trim the dog yourself or take him to a professional groomer, you must brush out his skirts regularly, paying particular attention to the area under the arms as this can get badly matted, and in some cases can actually stop the dog from moving freely. When brushing, make sure that you do really brush right through the coat, teasing out any mats that you find. It's all too easy to brush away superficially, so that the dog looks tidy, but not actually have reached down to the skin. In this case, when you run your hands through the coat, you will find mats and clumps of hair that are still knotted up. 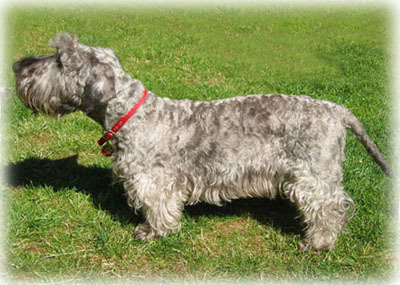 The Cesky Terrier is always groomed by clipping, and is never hand-stripped as are many other terrier breeds. Your puppy will have been clipped by his breeder before he comes to you, and if he is trimmed regularly you will be able to follow the correct lines. To keep a pet dog tidy, the body can be clipped with a #7F blade, using a #10 on the ears and tail. In winter, many pet owners find it much easier to have the skirts and beard shortened so that not so much mud and dirt is trampled into the house in bad weather. If you are planning to show your Cesky Terrier then it is important to make him look his very best. Good coats must be bred for, but even the best coat will benefit from regular bathing and conditioning. Grooming a dog for show is an art, and the best way to learn is from another exhibitor - then it's just a case of practising. Fortunately the coat grows quite quickly, so if you do make a mistake it can soon be rectified. 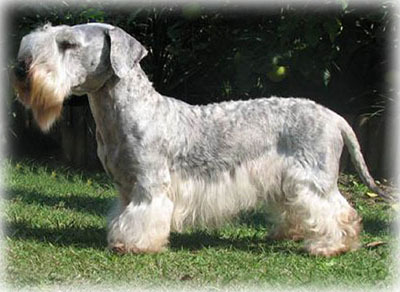 You can find an excellent guide to grooming the Cesky Terrier on the Kennel Garex website. If you own a Cesky Terrier you must be prepared to spend time and money on grooming. There is nothing more beautiful than an expertly presented Cesky Terrier but to achieve that look requires a degree of skill. Even the pet dog must be groomed regularly or he will become matted and smelly and may suffer from skin disease. If you are not able to trim him yourself you must budget for regular trips to the grooming parlour.